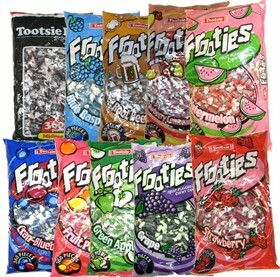 Out With The Old, And In With The New – New Candy For 2012! 2011 was a banner year for all of us here at Blair Candy, and we couldn’t be more thankful for it! We appreciate all of our loyal customers and can’t wait to ring in 2012. As the champagne corks pop and the bubbles flow this New Year’s Eve, our candylicious team is excited for all the New Candy for 2012! As you’re belting out Auld Lang Syne when that glittering ball drops (or prying your eyelids open to stay awake! ), come along with us as we get ready for the sweets 2012 has in store for us. M&M’s Mint Dark Chocolate – Mint and chocolate have long been refreshing pals, and they’re coming to us as the small, round chocolate candy favorites that we know and love. Dark chocolate is also known for its health benefits, so let’s clink to health and M&M’s Mint Dark Chocolate at midnight! 3 Musketeer Coconut – I certainly want 3 Musketeer’s signature chocolate-coated nougat to be a part of my 2012, and now that they’re adding coconut flavor to that nougat? Oh, what a slice of heaven. It has 40% less fat than most candy bars, so I can still stick to those weight loss New Year’s resolutions I’ll totally not keep this year! Jolly Rancher Crunch n Chew – Jolly Rancher has continually reinvented itself, from hard candies to gummies and lollipops. We’d love to add some jolly to our 2012, and with their hard outside and chewy inside, we’re ready to sink our teeth into 365 days of cherry, green apple, watermelon, and blue raspberry. Pez Muppets – Did you love the Muppets movie as much as we did? We can’t get enough of Kermit, Miss Piggy, Elmo and the gang, and they’re in Pez form for 2012! 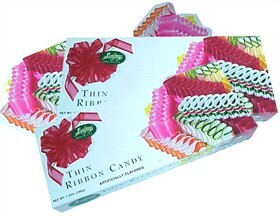 Keep a pack in your pocket, and you’ll be in for a sugary delight to make your 2012 a candy-coated one. Our New Year’s resolution this year? Simple – make it a sweet one. As Ernestine Ulmer’s delicious quote goes, “Life is uncertain. Eat dessert first.” Nostalgic Candy will never be forgotten, but oh, we’re toasting to a 2012 filled with candy and chocolate fabulousness. Happy New Year! Conversation Hearts Do More Than Get People Talking…They Get Them Crafting and Creating! Here at Blair Candy, we’ve already got Valentine’s Day on our minds weeks before we’ve packed up the Christmas decorations and put our presents in their proper place. Don’t get us wrong – we aren’t ‘holiday rushers’! We like to devote our personal time and energy to the current holiday season no matter what it may be, but when we’re at work we have to prepare for the next special day on the horizon. And that is precisely why we were placing orders for Necco conversation hearts and Valentine Peeps while we were still listening to Christmas music and sucking on candy canes. Yeah, we can holiday multitask with the best of ‘em! But our multitasking abilities go beyond this talent alone. We’re also good at multitasking while working – you know, answering an email while checking out the fresh candy stock while perhaps browsing Etsy.com a bit? And that’s precisely what happened this morning. Once I caught sight of the Necco conversation hearts – bags and boxes upon bags and boxes of sweet sentiments – I quickly remembered all the fabulous accessories the countless talented artisans of Etsy have whipped these sweet wonders up into, or used as inspiration for awesomeness! We can’t possibly feature every conversation heart creation on Etsy.com that we love – after all, this morning’s search for ‘conversation heart’ yielded 872 items! But we’ve chosen 3 favorites that we think would make a wonderful Valentine’s Day gift for the conversation heart lover in your life. Just don’t forget to include a bag of conversation hearts they can eat, too! Conversation Hearts Soaps – With an Etsy Shop name like SoStinkingSweet, we were already in love! That love only got stronger when we started perusing her virtual soap shelves and found not only the adorable oversized conversation heart soaps, but also “Goodie Goodie Gum Drops” soap and soap on a stick that serves as a delicious-looking double for a Neapolitan ice cream bar. Getting clean just got even sweeter! Conversation Hearts Valentine Cards – The Etsy artist behind the craftynikki shop creates some of the coolest, cutest Valentines you’ve ever seen! But for as darling as her set of Vintage Valentines are, it’s the Glitter Candy Hearts cards that have won me over most. Each set of 6 mini cards is just $3, making these aww-dorable and affordable! There’s Still Time to Get Your Christmas Candy Before Santa Comes – And Save 10%! The Christmas shelves at your local big box store may be bare, save a few broken candy canes and chipped mugs filled with cocoa packets, but we’ve still got plenty of sweetness in stock. And if you order today before midnight (EDT) you can save 10% storewide! Simply enter the code “SANTA10” at checkout and 10% will slip away into sugarplum dreams. Judging by the number of orders we’ve had rolling in, this was definitely a year for waiting until the last minute! (Don’t worry – most of us haven’t bought our Christmas candy yet either, and we work here!) The 10% savings will apply to whatever temptations you’ll find at BlairCandy.com, but we thought we’d put together a short list of popular picks to help keep your shopping short and sweet if you’re in a time crunch. Or should we say if you’re in a Junior Mints Peppermint Crunch?! It’s a mighty tasty crunch to be in, for sure. Candy Cane Trees – Awesome for every age! With our 10% off coupon code, these cute and clever candy cane trees come in at just over a buck apiece, making them a fabulously affordable little gift – and, they’re already decorated. (With little candies, of course!) These also make adorable little ‘favors’ – perfect for adding extra seasonal spirit to your holiday table. 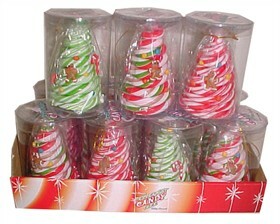 Simply place a mini tree at each place setting, and step back to admire the festive forest of peppermint pretties! Pez Dispensers – Many to Choose From! I’ve never met anyone who doesn’t have a soft spot for Pez and the collectibly-cool dispensers those tiny tabs of sweetness come packed in. Kids and adults alike can’t help but smile at the countless incarnations of Pez that have rolled out over the years, and Blair is excited to offer 11 different sets to choose from. Each box comes packed with 12 individually wrapped Pez dispensers with candy. Your set choices include: Disney Princess Pez, Star Wars Pez, Hello Kitty Pez, Marvel Comics Pez and many more! Give More than a Gift Card With the Help of Empty Candy Boxes! There is no denying the appeal of giving and receiving gift cards for the holidays. As fun as it is to shop for gifts, and open a shiny present full of promise, the simple fact is that even when we know which stores our friends and family love, we don’t always know exactly what it is they love in those stores. Or which color. Or which size. You get the picture! It’s not that we aren’t listening or aren’t attuned to the things they like, it’s just that the possibility for making a mistake can be pretty high, and mistakes mean waiting in long lines after the holidays to make exchanges and returns. And that’s only if they feel comfortable enough asking for the receipt! In tough economic times, many of us have cut back quite a bit on buying non-necessities. That makes the gifts we receive all the more important, allowing us the little luxuries we may not need, but definitely want! Getting gift cards from our favorite stores helps us check some items off this wish list without feeling guilty that we really should have saved the money, paid a little more on a credit card, or put it toward any of the other million more practical things. Gift cards force us to treat ourselves to something nice without worry, and that always feels good! But the simple fact remains that they aren’t as fun to open as presents. And giving pretty presents is as fun as opening pretty presents. Much more fun than just a card for sure. Oh, the dilemma! Don’t worry, we didn’t just write this post to let you know we share in your struggle. We wrote it because we have the solution! And, as it so often is, candy is the answer. A whole box full of candy, in fact. With a gift card nestled inside. You get to give the gift of choice, they get to go shopping without guilt, and you can wrap all that awesomeness up with some fabulous candy so they have a box to open and candy to open. This fairy tale practically wrote itself. So which candy to put inside? Consider the ages of the people you’ll be gifting, as well as how much candy you want to put inside each box, and how much you’d like to spend. 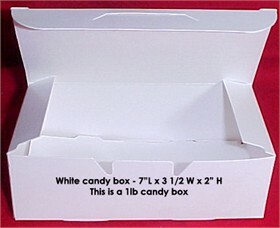 Our white empty candy boxes start at just $6.95 for 25, and can be easily personalized with stickers, markers, or glitter glue. You can also simply wrap them up with a ribbon or top them with a bow! To keep the filler cheap, opt for selections from our parade candy and bulk candy lineup. 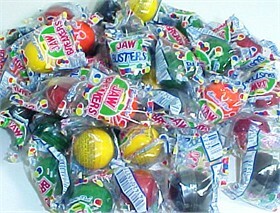 Options include: Jaw Breakers, Tootsie Frooties, Dum Dum pops, Goetze’s Caramel Creams and Jolly Ranchers. All tasty, all perfectly-sized for customized candy boxes!